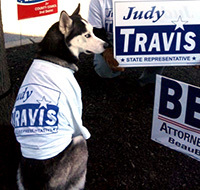 Be sure to VOTE 4 JUDY on November 8th! Polls are open 7am to 8pm. Click here to find out where you vote. Or call 866-276-2353. Judy Travis has long been there for our community and we hope you will join us as we enthusiastically embrace her run for public office! We know her as a small business owner, community volunteer and founder/president of the non-profit, “Stockings for Soldiers” program. and Make a Difference in Delaware! To her friends and neighbors in Brandywine Hundred, Judy Travis is known for her passionate community service. 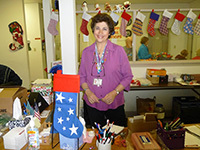 That’s because she founded “Stockings For Soldiers”, which has become one of Delaware’s and the nation’s best-known military service organizations. With her strong record of leadership and with over 30 years of experience as a small business owner and community volunteer, Judy is the voice we need in Dover to cut wasteful government spending, repair our economy, renew our schools, and make our government open and accountable again. For her tireless and passionate public service, Judy has been recognized by organizations like Rotary International, Bank of America, West Point and most recently as the recipient of the 2015 Governor’s Outstanding Volunteer Award. 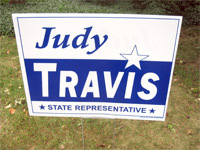 Join us in electing Judy Travis as our State Representative from Delaware’s 10th District. Be sure to VOTE 4 JUDY on November 8th! Not registered? Click here to register to vote. Out of town on election day? Click here to get an affidavit for an absentee ballot (click here if you are a Delaware resident who is a student in a different state and won't be in Delaware on Nov 8th). The Dept of Elections will send you a ballot via mail.